This semester in Advanced Broadcast Journalism 2 we told the stories of refugees in Canberra. We focused on the people’s stories, the ones that are too often ignored in favour of the political lines, scare tactics, negative stereotypes or a depiction of the ‘other’. We have had some excellent examples from the media this year on the right way to approach refugee and asylum seeker issues with programmes such as Go Back To Where You Came From on the SBS and Sarah Ferguson’s investigation into detention centres on Four Corners. Unfortunately, there are still far too many wildly inaccurate and harmful portrayals of asylum seekers. Today Tonight is a prime example as highlighted by Media Watch. In Strange Words -Refugee perspectives on government and media stereotyping (2003), Leach and Mansouri explored how damaging inaccurate reporting and manipulation of language can be. As I type this post ‘Detainee deluge – thousands of boat people to invade NSW’ is the second most read story on the Daily Telegraph website today. Like many other Australians, I wouldn’t be here if this country didn’t accept refugees. In the 1950s my grandmother fled Indonesia to resettle in Australia. She had a European background and the Indonesian revolution forced her family to leave the country. Having already survived a World War II concentration camp, she was a young woman when she came to Australia alone. Members of her family were scattered across Europe or America, wherever they were accepted. She doesn’t often choose to talk about these things, so most of my knowledge about refugees and asylum seekers has come from the media. My attitude towards refugees has always come from the very simple philosophy that if you can help people you should. Being born into a privileged society should not entitle you to a higher level of human rights. There are few things that infuriate me more than politicians using some of the most vulnerable people in the world to stir up fear and score points off each other with phrases such as “stop the boats” as campaign slogans. It’s dehumanising and embarrassing. It’s astonishing that we can use a term like ‘boat people’ whilst we simultaneously forget that they are people. People with friends and families, just like us, but without the privilege of being born into a society with rights we so often take for granted. The fear and negative attention directed at the asylum seeker arrivals in Australia is perplexing when you look at the figures. In 2009, 8427 people sought asylum in Australia, a small number compared to the 45,197 who sought asylum in the UK (Amnesty International, 2011). I thought I was well-informed about refugees and asylum seekers before I started this project, but when you delve into these sorts of situations, you start to realise how little you know. 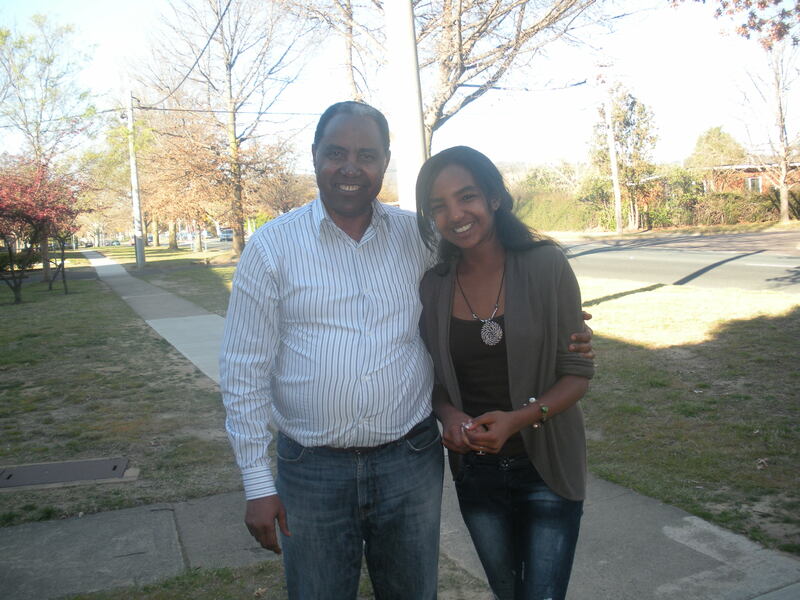 Olivia Neethyrajah (@oliviadn) and I were assigned a profile piece on Eritrean refugee, Teclu Ogbamicael. I knew nothing about Eritrea. I really mean nothing. I was quite sure it was in Africa, but I couldn’t have placed it on a map. I definitely couldn’t have told you anything about the political situation. Aside from some eye-opening facts and a crash course in the history and politics of Eritrea, it was wonderful to be able to speak with someone who was so open and candid about his experience as a refugee. I have always been quite judgemental towards those I believe are ignorant or naïve about these issues, but this project has definitely forced me to see that I am not without ignorance and naïvety either. We asked Teclu the hard questions; we discussed the war in Eritrea, his colleagues killed or arrested and what it’s like to leave your home and settle in a foreign country. When the conversation turned to Julia, his daughter that he’d finally been reunited with, I thought we had entered a happier, more comfortable part of the interview. But it soon became clear that this was the hardest thing for Teclu to talk about. Despite this reunion, missing his daughter’s childhood still weighed heavily on his shoulders. I realised I’d given very little thought to what happens next. Had I simply assumed that once the refugee is safe and once their family was safe they could live a normal, happy life? It’s not the case at all. This shouldn’t mark the end of support they receive. After hearing Teclu’s story and the amazing stories produced by my classmates in this unit, my opinions regarding Australia’s treatment of refugees haven’t changed, but they have definitely been strengthened. It’s a complex issue and I obviously don’t have all the answers, but I believe that Australia should play a much larger role in helping these people find safety. Most of the media in this country has made me feel quite depressed and ashamed at how refugees are treated in Australia, but this project has opened my eyes to the caring people in our community who help to make refugees feel welcome; organisations like Companion House, Canberra Refugee Support and individuals who offer scholarships to students. Refugees come to this country with nothing, they need more than a protection visa. The stories of these organisations are inspiring, they’re not told often enough, and I’m thankful to be part of a project that will share them. With every broadcast assignment I learn something new that will make me a better journalist. As usual, there were technical lessons learned (test the voice recorder on the interviewee, not yourself), there were improvements in my interviewing technique but there was something even more valuable to be learned from this unit. Over the course of this project I have given a lot of thought towards our role as journalists in forming attitudes and influencing opinions. As journalists we have the ability to affect the public’s perception on certain issues. When we’re dealing with the subject of refugees and asylum seekers we are sharing information with people who have a hard time relating to their plight. Most Australians have grown up with security. We have all been disappointed in our Government at one point or another, but it has never made us fear for our lives. Journalists should explain the situation in a way that encourages empathy. In every journalism unit we have had over the course of this degree we have learned the fundamentals of reporting. Be fair and accurate, tell each side of the story, report all the facts. However, to get a real sense of how the world works and how to relate to the people in it we must do more than tell the bare facts; a boat from ____ carrying ___ people was intercepted at ____. If we go deeper, if we learn who these people are, what has caused them to leave their home and what treatment they will receive in a detention centre – if we get to learn about these people as human beings, not as faceless statistics – we can begin to relate to these people and understand their situation. “The best way to understand the suffering of others is to hear their stories of hardship, courage, struggle and perseverance,” (UNHCR, 2011). This quote and the lessons I have learned from this project can be applied not only to reporting refugees, but to any issue that requires extra understanding. Society could certainly benefit from a little more empathy. In any story about people there is a human side that transcends statistics. We can’t offer a complete account of a story if we don’t address that. Reporting Refugees airs on Sunday, November 27 at 10am on 666 ABC Canberra, or you can listen to our stories online. Amnesty International 2011, ‘The Facts’, Rethink Refugees. Baidawi, A 2011, ‘Why ‘Go Back’ is compulsory viewing’ Unicef Australia blog. Guedes Bailey, O. & Harindranath, R 2005, ‘Racialized ‘othering’: the representation of asylum seekers in news media‘, In S. Allen (Ed. ), Journalism: critical issues (pp. 274-286). Berkshire: Open University Press. Leach, M. & Mansouri, F 2003, ‘Strange Words -Refugee perspectives on government and media stereotyping‘, Overland. McKay, F. Thomas, S. & Blood, R 2011, ‘‘Any one of these boat people could be a terrorist for all we know!’ Media representations and public perceptions of ‘boat people’ arrivals in Australia’, Journalism, July 2011 vol. 12 no. 5. UNHCR 2011, ‘The Human Story’, UNHCR News and views. Outstanding work, Rachel. Engaginly written critique – of both media practice and the literature. Your style is accessible and pithy. *Like* 🙂 But the substance of your piece is what’s most compelling. Some great realtime examples of media misrepresentation & very insightful appraisals of your own practice. Well done.